Automation Service provides all the power of the Bizagi Digital Business platform directly in the cloud. With Automation Service, customers run applications with business processes in a secure, reliable and high performing cloud platform. This tutorial illustrates how you, as a customer, would build those applications with business processes. This tutorial sets you up with the basics of producing a simple yet fully-functional process, considering a secure design, and through ten steps which you can complete within about an hour. This tutorial does not by any means cover all the features and concepts supported by Bizagi as a platform. You build applications and business processes through the Bizagi Studio (Windows desktop application). This tutorial presumes you have already installed Bizagi Studio and have created a Bizagi project to work on. For information about how to install Bizagi Studio on your own desktop or servers (on-premises), refer to the Bizagi Enterprise installation guide. For information about how to create a project in Bizagi Studio, refer to the Project creation guide. To illustrate how you can build process applications in Bizagi, we will create an application implementing a Help desk process. With Bizagi, you can create an application with any number of processes, but for the sake of simplicity in this tutorial, we will create just this one. The Help desk process you develop this tutorial (starting from its workflow) is an oversimplified representation of a real Help desk process. It only includes three activities on purpose, so you can complete the tutorial in a shorter period of time. Processes in Bizagi do not have a limit regarding the number of shapes you can include in the diagram; and you can choose to include sophisticated modeling patterns supporting long-lasting transactions, multiple sub-processes, activities executed in an asynchronous/offline fashion, compensation events, messaging and collaboration between different processes, triggering business events (either by external applications or automatically by the system, based on a schedule, or due to changes in the underlying data), among others. If you want to review this ready-to-use process, or others, visit the Bizagi Process Xchange. You may of course, further customize and extend this process by including additional activities and business scenarios. Through the Help desk sample process presented by this tutorial, you can see how different users (having separate roles), work with Bizagi, while having ACLs in place to establish well-defined boundaries about what each role may and may not do. This tutorial, will give you a good idea of how you build role-oriented, and secure process applications. 1.A requester: is in charge of initiating the process and eventually confirming that it can be ended. The process starts when a requester fills out a ticket to seek for assistance (using a Report ticket, as depicted by the simplified Help desk flow). After receiving a response, the requester confirms whether the problem or difficulty has been resolved (by completing Confirm resolution). 2.A Help desk agent: is assigned to analyze the problem or difficulty recorded in the ticket and provide a solution. When a new ticket arrives, a help desk agent sends suggested steps to resolve the ticket (by completing Analyze and resolve). 3.An admin: Will not interact in the process. •Menu options related to overall system administration. •Reports and queries supporting analysis and monitoring focused on the process and the user experience. Follow these steps to implement the Help desk. 1. Load your Bizagi project. Bizagi presents presents a graphical Process wizard which guides you through a series of points to consider when building your applications. The Process wizard presents seven steps in a carousel, though we will not use all of them in this tutorial. We also use some configuration options, which appear outside of this wizard. For detailed information about this guided assistant, refer to the Process wizard. Modeling the process means graphically diagramming the series of activities that make up the workflow of a process, from start to end. For this tutorial, it means depicting and interconnecting the following logical steps as used by the Help Desk example: Report ticket, Analyze and resolve, Confirm resolution, Review and document, along with other secondary shapes. 2.1. Click New process in the Process wizard step number 1 ("Model process") and give your process a name. 2.2. Start by dragging a Lane from the Palette into the upper part of the Help Desk process Pool. Its default name is Lane 2. You can edit text on labels by double-clicking them. 2.3. Rename default elements in the canvas (using the right-click and Edit text options) to have a tidier and self-descriptive process model. Delete the Milestone 1 default label (by renaming it to blank), and use the labels as shown in the image below (Requester, Help desk agent). You can also make the diagram tidier by resizing the lanes (by clicking the Help desk process Pool, and then relying on standard mouse resizing options to shorten its height). Label this Start Event for clarity purposes. 2.5. Add an Activity following Report ticket, by using the Pie menu. The Pie menu is the set of elements popping up to the immediate right, when you click a given shape. The activity's default Task 1 text highlights and you can rename this shape. 2.6. Add another Activity after Analyze and resolve, using the Pie menu the same way as before. Name this new Activity as Confirm resolution. Using the Pie menu makes it quick and easy to draw the process diagram; however, dragging and dropping shapes from the Palette (and connecting them afterward by using Sequence Flows) is also an option. Over the next steps, complete the process diagram, by using some of the features you have learned. 2.7. Add a Gateway starting from Confirm resolution by using the Pie menu. Label the Gateway Was the ticket resolved?. 2.8. Add an Activity starting from Was the ticket resolved? using the Pie menu. Name this new Activity Review and document. 2.9. Add an End Event starting from Review and document using the Pie menu. Label the End Event End - Ticket is closed. 2.10. Connect Was the ticket resolved? shape with Analyze and resolve using the Pie menu. Where the workflow continues from the Gateway, and because this specific shape is meant to support the process workflow splitting into more than one possible path, you can also use the Pie menu to include an additional Sequence Flow that automatically draws a connection to an existing shape. 2.11. Label both paths parting from Was the ticket resolved?. You can fine-tune some minor visual aspects of your diagrammed process for clarity purposes. This means repositioning some labels (by selecting and moving them to the new location), and reorganizing how the Sequence Flows routes appear (especially the one labeled No). 2.12. Include SLAs for your Activities. As a final step, define the estimated time for completion of each of the three Activities. Right-click Analyze and resolve and then click Properties. For this tutorial, set a 24-hour duration for Analyze and resolve. Inputted values or changes to them are temporarily saved, and permanently saved when you save the whole process diagram. Repeat this for the other two Activities. For Confirm resolution, click it and set a 16-hour duration. Finally, for Review and document, click it and set an 8-hour duration. Once the process diagram is closed, you return to the Process wizard. 3. Design how to store your information. Modeling data involves defining structures to hold information that your business requires. With Bizagi, you do this by defining entities and their inner attributes, to organize how information will be stored, as well as defining possible relationships between entities. For further information and concepts about this step, refer to Modeling data. For this tutorial and for simplicity, we define a very basic Help desk data model that contains the ticket's subject, a description, and file attachments for starters, as well as other bits of information involved further on during the process such as: which are the suggested solution steps, whether the ticket is resolved, and documentation comments. Even though this tutorial does not focus on it, you could make the most of the potential of data modeling within Bizagi by features like defining multiple-to-multiple relationships between entities, defining entities which inherit from others, and involving system entities which already manage information used by Bizagi ("metadata"). 3.1. Click Model data at the Process wizard step 2 to define the name of your main process entity. For this tutorial, accept the default value "HelpDesk". Once you define the process entity's name, you see a visual representation of the Help desk process' data model (based on the concepts of entity-relationship diagrams); displaying initially only the process entity you just defined. 3.2. Click Add to include four new attributes and give them names. Add these as String type attributes (to store text). After clicking Add each time, provide the Display Name for each attribute (the Name you may leave it as it is automatically generated). 3.3. Click Add to add a fifth attribute. For this new one, change the type of data it manages from String to File. By clicking Add, naming the attribute as Ticket attachments, and in the third column (Type) selecting File so this attribute supports having the user upload documents or file attachments in general. 3.4. Click Add again to add a sixth attribute. For this new one, change its data type to one that is not from the Common Types list. When you click New entity, a new wizard appears, in which you can define the structure of Severity as a separate entity. In general, defining Entity data types lets you define reusable entities which you can navigate into, starting from the one currently standing on (HelpDesk). The Severity entity used in this tutorial stores a preset list with values to choose from (in this case, a Critical, Medium or Low qualification that enables a classification of tickets). Each instance of a Help Desk entity will have an attribute of type Severity to store the level of severity of the case. The possible severity levels are predefined, as you will see later in the tutorial. 3.5. Click Next to move to defining attributes applicable to Severity. 3.6. Click Add to define two new String attributes. When you have created the Severity entity, Bizagi takes you back to the attributes definition of the main HelpDesk entity. 3.7. Click Add to define a final attribute, this time using Boolean type. This attribute stores the status of the ticket (whether it is resolved). You can re-arrange the position of entities within the diagram for clarity purposes. Some information about the execution of the process is already stored and managed automatically by Bizagi, such as the starting date of each process instance, its creator/requester, its estimated SLA, among others. This means that there is no need to explicitly create as business data such information fields. When the data model diagram closes, you return back to the Process wizard. Defining forms means building how the process presents and captures information for the users during the Help desk process. This is the UI, the user interface. When doing this in Bizagi, you rely on a Forms designer where you can drag and drop attributes of your data model, and get an instant preview of how it would be presented to end users (a what-you-see-is-what-you-get approach). With Bizagi, you design UI only once. Each of the different devices in Bizagi display the information while leveraging some native controls to provide best usability. You see a display of the entire process diagram, focused on those shapes in the workflow which are designed for human interaction and for which you need to define a user interface. •To the left: The attributes and relationships available for the Help desk process (in the Data tab), along with UI controls (in the Controls tab). •To the right: A preview of what end users will see. The display updates instantly as you design the form (in this case, when creating the user interface for Report ticket). 4.3. Double-click the Subject attribute to include it in the form. You may need to expand the item representing the HelpDesk entity. The form you are defining lets a user to start the process by submitting a ticket to the Help Desk Agent. You can drag and drop attributes into the form (though we recommend using double-click to build the form faster, specifically at this point in the tutorial). 4.4. Add these other attributes: Detailed description, Severity, and Ticket attachments. 4.5. With the CTRL key held down, click Detailed description, and Severity to select multiple fields at once. This lets you quickly configure properties they share. Select the Required property and, from its drop-down, select Yes. You can, if you prefer, configure the attributes one by one. 4.6. Click Ticket attachments to configure how this form allows end users to upload files. This way, you are enforcing security parameters so that, for instance, really large files or any file types other than the ones specified (such as potentially harmful ones) aren't permitted. 4.7. Close the form and click YES (Save), when prompted to save changes in the form. 4.8. Back in the process diagram view for the forms, click Analyze and resolve to define its form. Notice that Report ticket no longer displays an alert because its user interface has been configured. 4.9. Switch to the Controls tab, and expand Containers. There, double-click Group, to include it as a control in the form. With this form, a Help Desk agent can review and resolve the ticket that was submitted by the Requester. After reviewing the issues and severity of the case, the agent can provide step by step instructions for the Requester to solve the issue. When you include the group, it highlights and the cursor becomes active within the text field so that you can edit it. 4.10. Rename the group by starting to type. Delete the default Group label, and name it as Ticket details. Click the OK icon or hit Enter when done. 4.11. Once the group is created, drag and drop attributes from the Data tab into it. Make sure you drag Subject and release it well inside the group (when the "Drop Here" message inside highlights by showing a greenish line). 4.12. Repeat these steps for these other attributes: Detailed description, Severity and Ticket attachments. You can choose to double-click each of the attributes to include it at the end of the form, and then drag it into the group. 4.13. Select all four attributes and set them as Editable = No. To do this, click Subject first, then hold down the CTRL key and select the other attributes: Detailed description, Severity, and Ticket attachments. You are explicitly defining which information users are allowed to see and at each point in the process. Further, for the Analyze and resolve form, we are setting which information users can add or edit. Even though this tutorial does not focus on it, you can also set that each UI field dynamically as visible, editable, or required, based on a business expression considering value of another attribute, or based entirely on the user's input when filling out other UI fields in the form. For more information on this, refer to Customizing controls behavior. 4.14. Switch to the Controls tab, expand Containers and double-click Group and add a new group. 4.15. Add the Solution steps attribute into the Analysis group. Click its UI field to edit its properties. 4.16. Close the form and click Yes (Save), when prompted to save changes in the form. 4.17. Back in the process diagram view for the forms, click Confirm resolution to define its form. 4.18. Click the Copy from option available in the upper ribbon. This form appears to the Requester once the agent has analyzed and the ticket and proposed a resolution. The Requester will be able to see the information that the agent added, use it to try to resolve the issue and confirm that the issue was resolved, if it was. 4.19. Click Analyze and resolve to select the form from this Activity and click OK. This action modifies your current form to look the same as the one you defined for Analyze and resolve. 4.20. Click the Solutions steps UI field to edit its properties and set it as Editable = No. 4.21. Add the Ticket resolved? attribute by dragging and dropping it into the Analysis group. 4.22. Click tthe Ticket resolved? UI field to edit its properties and set it as Required = Yes. 4.23. Click the Properties option found in the upper ribbon, to edit the general properties of the form. For this form, enable the use of User Confirmation, by setting Needs user confirmation = Yes and assigning a User confirmation message. For the User confirmation message, provide something like: "Note: confirming that the ticket is resolved cannot be undone". 4.24. Close the form and click YES (Save), when prompted, to save your changes to the form. 4.25. Back in the process diagram view for the forms, click Review and document to define its form. 4.26. Add the following six attributes into the form, by double-clicking them: Subject, Detailed description, Severity, Ticket attachments, Solution steps and Documentation comments. Finally, when the issue is resolved and the resolution is confirmed by the Requester, the agent see the interface you constructed in this section. The agent will be able to add any additional documentation comments for review purposes. 4.27. Select all UI fields except Documentation comments, and set them to Editable = No. You can select multiple UI fields by holding down the CTRL key while clicking each field you want to select. 4.28 Close the form and click YES (Save), when prompted, to save your changes to the form. You return to the process diagram view for the forms. Now all Activities have their user interfaces set up (none show an alert icon). Since the system handles End Event and Gateway, they don’t need a form or a user interface. At this point, you have defined how data used by the Help desk process is captured and displayed. Defining business rules means setting the logic that runs behind the processes. Business rules support both: expressions used for the workflow's routing (presented in Define expressions), and processing/triggering certain actions (presented in Activity actions). For this tutorial, we only consider setting the expression used for the workflow's routing, which applies to Gateways, where you have Bizagi evaluate which of the possible paths the process should take. Even though this tutorial does not focus on Activity actions, through these you can run sophisticated operations, calculate values automatically, integrate other systems or emailing services, and invoke web services, among others options. This is an alternative to going back to the Process Wizard, since it is a shortcut that can launch any of the first six steps in the process. When you click Define expressions (a section appears inside of step four in the Process Wizard), you see the entire process diagram; but this time, the display focuses on Sequence Flow. You need to define how they become active. As when defining forms, the elements which haven't been configured yet are highlighted (with yellow shadowing). Clicking the New button directly is a shortcut to create a new expression of the "Standard" type. 5.5. Drag and drop the Ticket resolved? attribute into the first box on the right panel. 5.6. Click <insert an operator>. From the presented drop-down list, select is equal to. 5.7. Click <insert a value>. From the presented possible values, for the Ticket resolved? attribute, select true. Because this attribute is of the Boolean type, true and false are identified as the only possible values. You return to the process diagram view where Sequence Flows are highlighted. The path labeled Yes is now properly set (no longer highlighted). At this point the expression you defined, evaluates a statement as either true or false. Whenever this expression becomes true, Bizagi activates that specific transition (provided that the workflow has advanced to the Gateway). 5.9. Click the Else (when no other option is valid) checkbox. You return to the process diagram view where Sequence Flows are highlighted, but this time you can check that both paths are properly set. Note that there is a diagonal line across the "else" path. You see the entire process diagram, but this time it focuses on Activities. You need to define to which users these apply, and exactly how. Defining performers means configuring the algorithms and conditions employed, for each of the different Activities, so Bizagi can assign workloads to process participants. Assignment of work to process participants is most often based on role definitions, though it is not necessarily bound to them (i.e, you may base workload allocation on other criteria such as geographical location, position or area in the organization). For further information about performers, refer to Process participants. Tutorial only consider distributing workload according to role definitions, as we described at the beginning, where a Requester and a Help desk agent role are involved. 6.1. Click Analyze and resolve. A wizard guides you through the definition of allocation rules. This action lets you include a condition box to define this Activity's assignment. 6.3. Click the new condition box (Click to open properties), then select the Role property from the drop-down list. 6.4. Leave the Equals and Expression default values for the next two drop-down lists, and click the plus sign to add a new role. 6.5. Enter "Service agent" in the Value text box for this role. Click Add when done. This condition is now configured so that Analyze and resolve is assigned to the user with least amount of work, who has the role of "Service agent". 6.6. Click the drop-down list for the Assignation method and change it to Sequential. The wizard closed and you see the process diagram view focused on performers. 6.9. Repeat the procedure you used with Analyze and resolve. That is, start by adding a condition box, and then click it to define its properties. 6.10. Set the condition to evaluate the user's role, but this time define a new role called "Requester". Do not change the default assignment method (it should remain By load). You are return to the process diagram focused on performers. Since the condition for Review and document is the same as for Analyze and resolve, the same procedure is applicable. A difference this time, is that you don't need to define a new role. Refer to a previously created one. Bizagi includes a heuristic in its assignment algorithms. The By load assignment method always gives priority to a user who has previously worked on the same process instance (if the user meets the assignment condition). Leave the assignment method set to By load. 6.14. Click OK when done. You are return to the process diagram focused on performers, and can now see that performers for all Activities are properly defined. Setting authorization means configuring access rights so you can establish well-defined boundaries around what each of the roles may and may not accomplish. In this tutorial, we set access rights according to role definitions. Only a Requester can start new process instances; only a Help desk agent can work on assigned Activities; and only an Admin user has access to system settings, general configuration and monitoring options including BAM, analytics or reports. 7.1. Click Expert in the upper ribbon to move out of the Process Wizard and into an advanced view based on modules. For this tutorial, we accept the default authentication option, local authentication, though Bizagi supports integration with identity providers such as Microsoft ADFS, Microsoft Active Directory, and Azure AD. To learn more about integration with identity providers, see Authentication. 7.3. Expand the Pages item and set which roles are authorized to view and use each of the options presented to end users. 7.4. Start by clicking Alarms (the first of the sub-items). Click OK to close the pop up window. Bizagi now restricts to the Alarms menu option to end users having the Analysis role (when you explicitly include on authorized role, all other roles and users have access denied by default). 7.5. Repeat this procedure for the other sub-items found in Administration or Analysis, as listed above (all except Cases / New case). Remember to click OK to save your changes to each sub-item (otherwise the Allow / Deny radio button selection is not persisted). 7.6. For the remaining sub-item (Cases / New case), repeat the same step as above. 7.7. Go back to the Administration / Users sub-item. 7.8. Select Default Assignation users from the drop-down list and click OK.
7.9. Click Default Assignation users in the upper pane and then click Allow. Enforcing case privacy means restricting visibility and access to process instances (cases) so only end users who are working on them (or have worked on them previously), can see their information. You set visibility while in the Expert view. 8.1. Click the Processes module, which is the first one in the list at the left, and locate the Help desk process. 8.2. Right-click version 1.0 of the Help desk process and select Properties. You may need to expand the Applications, App, Processes and Help Desk items. 8.2. Select Private in the Case security drop-down list. You can also take this opportunity to define an SLA for the complete process. For this exercise, input an Estimated duration of 24 hours, a Lower limit of 1 hour and an Upper limit of 48 hours. Configuring parameter entities means defining the use of business keys as a best practice (oriented to data integrity, performance and integration and security with other systems) and providing starting values so they are treated as entities providing parameters in Bizagi. Business keys prevent you from adding duplicate values, implement use of indexes for best performance, enforce exchanging information with other systems while using security by obscurity and ensuring the correct logical record is addressed. You configure parameter entities in the Expert view. 9.1. Click the Entities module in the list on the left and locate the Severity entity. You may need to expand the Parameter item. 9.2. Switch to the Business key tab, and check the Enable business keys checkbox. Clicking OK closes the window and returns you to the Entities module view. 9.5. Use the Add Severity button to input a new value. This entity is designed to have Critical, Normal and Low severity. After you click Add Severity, the cursor is in the first column needing your input (Name for this value). Enter Critical for this field and input S01 for the Code. 9.6. Repeat this step to add the other two values. Add Normal with S02 for its Code, and then Low with S03 for its Code. At this point, the parameter entity is properly set up, and no further configuration is needed within Bizagi Studio for the scope of this tutorial. 10. Configure sample end users. 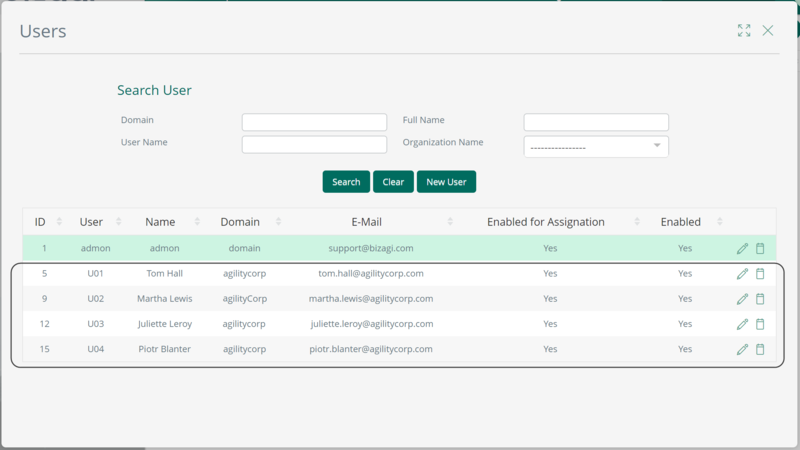 Configuring sample end users means creating users for the Help desk process so you can test everything that you configured in Bizagi Studio. Real end users are never created inside of Bizagi Studio, but in the actual runtime environment by means of the Bizagi Work portal (the application that presents the processes to end users). Since Bizagi Studio bundles an integrated Work portal, you rely on this option to perform quick prototyping, unit tests, and overall verification of how the processes behave in execution. The integrated Work portal featured by Bizagi Studio presents everything exactly as will be presented in a Production environment to end users. For this tutorial, create four end users: one requester, two service agents, and an admin user. This is apart from the default internal system user which is shipped in with Bizagi. You can also use the quick access icon. By default, the first time you access the Work portal you do not see a login page, since this is the bundled one for Bizagi Studio that has no users created so far, other than the default internal system user. 10.3. Click the New user button to register a first sample end user. 10.4. Add details in the Basic Information tab, for the first user. 10.5. Switch to the Organizations tab, and assign the current default Organization (named Organization). Then clicking on the >> button to move it to the side box. 10.6. Switch to the User configuration tab, and assign the role for this user. Click Requester on the Roles line, then click the >> button to move it to the right-side box. Click Save to persist this user. You may need to scroll down in this window to access the Save button. When you save the user, you return to the window where you see all users listed. At this point, you should see the currently used default Bizagi system user (admon), as well as the one you created. Click New user to repeat the these steps for a second user. 10.8. Switch to the Organizations tab, and assign the current default Organization (named Organization). 10.9. Switch to the User configuration tab, and assign the role for this user. This time click Service agent on the Roles line, then click the >> button to move it to the right side box. You may need to scroll down to click Save and persist your changes. 10.11. Click New user to these same steps, for a third user. Scroll down and click Save to persist changes. At this point, you see the three users you created so far, plus the default internal system user (admon). 10.12. Click New user to repeat the same steps to create a fourth and final user. 10.13. Close the user administration window. Access the Work portal with the different users you created, to verify how the built process behaves. You can test every scenario for which you designed and configured your workflow in Bizagi Studio. Your application’s behavior should reflect the behaviors you designed. If it does not, testing will reveal where your design needs refinement. In the browser, use the login page. If you closed the browser, launch the Work portal again by using the Run button in Bizagi Studio. Click Log in when done. For this user with the Requester role, admin menu options and further possibilities are disabled. Enter text of your choice in the fields for a new ticket. You can choose to include up to two attachments as evidence to support the ticket. In the dialog that appears, click Choose file to upload a local file as an attachment. Click Upload when done. You can repeat this step so that your new ticket has two attachments. Click Create you are ready to submit the ticket in the built Help desk process. After you submit the ticket, you see a confirmation message and a statement about this user not having further pending work. The submitted ticket has been numbered as case 1, and it is currently assigned to user U02. Repeat the previous steps to create another new case. Fill in at least the minimum required fields (Subject, Detailed description or Severity), and click Create when done. You may provide any details you want, and choose to skip uploading attachments. This second case is created so you can verify that the assignment algorithm is working as expected, and that this new case is assigned to the other user associated with the Service agent role: "Juliette Leroy". The submitted ticket has been numbered as case 2, and it is currently assigned to user U03. When logged out, you return to the initial login page. Click Log in when ready. Once you have logged in to the work portal as this user, the Inbox automatically displays pending work for the U02 user (Martha Lewis), and in this scenario, you have an Analyze and resolve activity pending for case number 1. When you click the pending activity, you see the UI for it, as you designed in Bizagi Studio. You can choose to click the files attached by the submitter to download and view them. The important point in this step is to fill out the Suggested steps field. When you click Next, you see a message that there are no further pending activities. Use the search box located at the upper right corner, to browse for a given case. Type 2 as the case identifier (the one assigned to user U03 -Juliette Leroy-) and hit Enter key. No results are displayed, because case security, which you configured through Bizagi Studio, is working effectively not allowing an unathorized user to view details of a case not assigned to that user. Using the search box again, browse for a case you have worked on. This time, type 1 as the case identifier (the one which was already assigned to this user U02 -Martha Lewis-) and hit Enter key. This case has already moved forward into the Confirm solution activity. The current user, having been a participant in this case, can view its details. Locate the process diagram graphic view icon to the left of the one-line summary information, and click it. You see a graphic depiction of the process and this case’s progress through it. Hover the mouse cursor over the currently pending Confirm solution activity, and it displays which user is currently assigned to that activity and its relevant dates. 14. View details from previous activities. Click the Path button to highlight the complete path taken by the case. You can hover the mouse cursor over Analyze and resolve activity to learn details of that activity's completion. So far, none of these users (U01, U02, or U03), has access to admin or further menu options beyond the Inbox or Live processes (which you may ignore for the scope of this tutorial). You do not need to log in with user U03 since it has the same role and expected activity as user U02. User U03 was created so you could validate how the assigning algorithm distributes the two submitted tickets evenly: case number 1 going to user U02, and case number 2 going to user U03. You see the Confirm solution activity as pending for this user, for the same case as before (case number 1). Upon clicking on the pending activity, you see with the UI for it that you defined in Bizagi Studio. For this step, you can review details on the ticket plus the suggested steps as entered by the Service agent; however, the main thing for this user is to fill out the Ticket solved? field. Tick the Yes radio button and click Next when ready. You see a notice that there are no further activities expected from this user. You see the Review and document activity as pending for this user, for the same case worked on before (case number 1). The assignment algorithm evaluates that the same user U02 should work on this case since they have worked on it before, so user U02 has priority over user U03 even though both users have the Service agent role that meets the assignment condition. You see the UI for the activity that you defined in Bizagi Studio. For this step, you can opt to add comments for documentation or for the incident's post mortem review. Provide some comments and click Next when ready. Though you see a notice that there are no further activities expected from this user, use the search box to browse for this you just worked on. Type 1 as the case identifier and hit Enter key. You see there is no due date since the case now has no pending activities. You can see how a case has been handled in a business representation of the Help desk process (an example of an instance that took the sequence of activities as shown above). You have now built your first application in Bizagi, offering a sample process, previewed it, and verified that it would work property for an end user in a Production environment. If you want to deploy your application and test it in the cloud, refer to the next section. To see this process in action directly in the cloud, you can export your application with the Bizagi Studio and import it into your cloud environment. The instructions for exporting and importing are at From Studio to the cloud.